of Cracow, the very chapel in which Karol Wojtyla was ordained to the priesthood in 1946.
members of Cardinal Stanislaw Dziwisz’s household. the auxiliary bishops of the Archdiocese of Cracow, Józef Guzdek and Jan Zajac. a prolonged moment of absolute silence, during which Benedict XVI remained engrossed in prayer. Like the other Holy Masses during the papal pilgrimage to Poland, the liturgy was celebrated in Latin and Polish. A choir composed of seminarians from the Cracow Seminary was signing during the Holy Mass. The first reading, an account from the Acts of the Apostles on the appointment of bishops, was read out in Polish. The Gospel pericope, read out in Latin, referred to the Good Shepherd, who will not leave his sheep (Jn 10:12-16). among them there were representatives of the German town of Marktl am Inn, the hometown of Benedict XVI. Prior to the entrance to the Church, the Pope was greeted with bread and salt by the town mayor, Ms. Ewa Filipiak. which also bears signatures of John Paul II. through the successive rooms of the house and listened to the guided tour offered by the sister curator. in the Museum’s commemorative book. Having left the home of Karol Wojtyla, Benedict XVI met with the residents of the town. "Welcome," "We love you,"
Welcoming the Pope, Cardinal Stanislaw Dziwisz said: "Your arrival in Wadowice adds to the history of Karol Wojtyla." belonging to the community of the People of God. It strengthens us on the way to the house of the Father," said Cardinal Dziwisz. together with the town’s inhabitants for the beatification of the Polish Pope. of holy Baptism." He also called John Paul II a witness to the faith in the observance of your baptismal promises. He underlined the fact the John Paul II’s love for the Church was born precisely in the Wadowice parish. "In it he experienced the sacramental life, evangelisation and the formation of a mature faith," he explained. that the Polish parish might be truly an "ecclesial community" and a "family of the Church." to the cheers of the crowd and set out for Kalwaria Zebrzydowska, some 13 kilometres away. 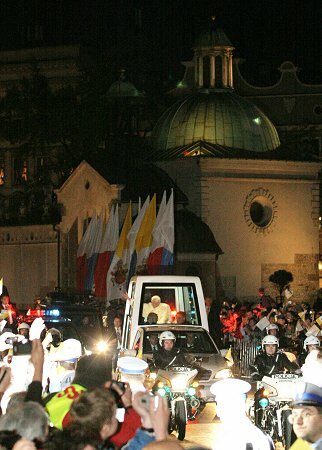 A then the excitement reached it's top: Pope Benedict, in his papamobile, slowly (for us it lasted only seconds) drove in front of us. (Screams, laughs, general crazyness). I thought I should have THREE hands: two to hold my cameras and one to wave the papal flag. After some junk food meal (I know, not healthy) I moved to the city centre to get known with the Pilsudski Square (I don't know Warsaw very well). There were many people walking by, staring at the huge cross over the altar, exchanging their thoughts and memories, taking pictures. I strolled towards the Old Town. The second time I saw our Benedict, was in front of the Presidental Palace. It was quite by accident that I was there- I was just wandering along the streets, when I noticed a gathering crowd. My Polish genes acted immidiately: where there is a crowd, there must be something interesting going on. I placed myself in front of the Palace and waited, singing together with nuns who made a real show that afternoon - leading the chant (of course) "Be-nedetto" and, in rough translation, "We have the new one, we have Benedict XVI" (on melody of "Guantanamera"), "Please come to us at last, Alleluja!" (after 2 hours of waiting). After an hour or so our Holy Father arrived, this time by a limousine, so I didn't take any fancy pictures. (I took some with my long zoom analog camera, have to wait for the results). There was a loud buzz, when a security guy DARED to stop his big car in front of us interrupting our view. Scared, he quickly moved the car. Sue, thanks for the great photos and diary of your trip. Hurry and catch up with your work. I want to know what happens next in your story. That is so wonderful you got to see Papa despite all the crowds. It's wonderful to get the personal accounts and pictures. They add another dimension to the story. Those four days were really special, to be able to see so much of the Holy Father. It gave me great choy to see how Papa was embraced by the Polish people. Willow, I agree 100%. One of the blessings for our forum certainly is that we have our Polish friends who contribute so much with their enthusiasm and in this case, were eyewitnesses themselves. Thank you, girls (including Tetras, who posted a number of news pictures from onet.pl almost immediately in the main forum). And of course, Tomasso - your impressions from all your TV-watching of those four days will be most welcome! The next day, 26 May, was the Big Day. I got up at 4:30am, took the first tram to the city centre and at 5:30am I began to make my way through the crowds storming Pilsudski Square. As it showed (and as I had feared) I was too late to get any good (first row) place. Some pilgrims were at the square at 3 am or even earlier. Can you imagine!? I put up myself among the Belorussian pilgrims, many of them were of Polish origins. My sector, C2, was totally international, with people from Lithuania, Belorussia, Ukraine, Slavakia, Czech Republic, Germany, England, Norway (that's me! ), New Zealand (!) and some other rather exotic spots which I don't remember. Before the Mass somebody had read out those places - Yvonne, do you remember the other countries mentioned? I didn't even dare to look for sector D4 and Yvonne, since I was alone and wanted to keep my place. But I knew she was there. Before 8:30am, when the sectors were to be closed, there were so many people that it was difficult to sit. And it rained, most of the time not very heavy, sometimes it teemed, all in all enough to get everybody wet. I stayed relatively dry thanks to my rain-jacket and rain-trousers, but my rucksack was completely wet. I just managed to protect my cameras. I watched all those people, including me, with bowed heads to protect their faces, covered with their raincoats and pieces of foil, many of them tired after all-night trip, wanting to see and hear our Benedict. Towards the D4 sector, where Yvonne was. Short pause during the rain. Shortly before the Mass we started to practice our responses to the Holy Father, especially the Latin ones. (We are not much used to use Latin in Poland, unfortunately). The Mass was to said in Polish and Latin. 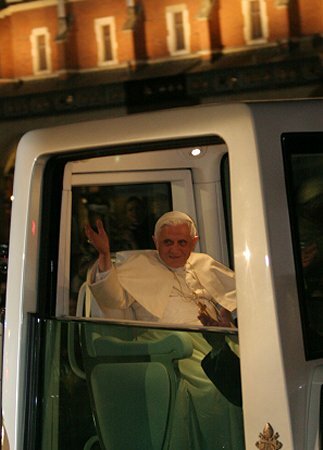 And finally we heard the roar of the crowd: Pope Benedict was aproaching us in his papamoblie, smiling and waving to . I jumped up on my little tourist stool, found some balance (THAT wasn't easy) and press the shutter of my camera, shouting wildly. Of course everybody did the same thing, exept maybe for jumping on stools - luckily for me - so I managed to take some usable pictures. After this wave of excitement I tried to calm down a little (almost impossible), since the Mass was about to start. Then the entrance song sounded, those yet sitting, stand up and after a while we heard a soft voice with a little funny accent, saying: "W imie Ojca i Syna i Ducha Swietego!" ("In the name of the Father..."). YES! Uuuiiii! Ohhhhhh! Uuuiiii!! Oh, pull yourself together! Pleease...(All that running through my head in a second). Eventually I managed to answer to the Holy Father "Amen!" Then the Primate, Card. Glemp said words of welcome, mentioning in a funny way the rain "Oh, it's only a May drizzle. We endure it!" Everybody laughed. Since I wanted to focus totally on Pope's homily and the Mass, I didn't take any pictures - with exeption of a short recording of Benedict's soft voice when he read the Italian part of the homily. The file is too big to put it on the forum. If you want it and I find a way to convert it or extract sound from it, I will put it later. I didn't see, luckily, what happened after the Mass, when Holy Father almost escaped his bodyguards and mingled with the crowd. When I watched it later on tv, I almost had a heart attack. I'm rather young, so I survived. But PLEASE, Holy Father, be careful!! And they say he's a man who sticks to the schedule and doesn't like to surprise people! As I began to make my way through the throng rather quickly (experience gained during past, also crowdy, meetings with JP2) I spotted dark-skinned nuns (rather not from Poland ) and people from Asia (Vietnam maybe?). I am soooo happy that I decided to make this trip to Poland. I could watch all the events live or on tv and feel this incredible atmosphere of feast and solemnity at the same time. Some of you asked about amount of people present at Pilsudski Square. I believe 300 000 is close to reality (though I honestly don't know how many people without tickets gathered around). The very square can accomodate 100 000 (and that many tickets was distributed). Some journalists underline that in 1979, with JP2, much more people gathered. But they forget that the square is much smaller now, surrounded by new buildings. In 1979 it could accomodate 300 000. Besides I think that the Mass in Warsaw was a kind of a warm-up so to speak, both for the Pope and the people. We had to defeat our shyness. 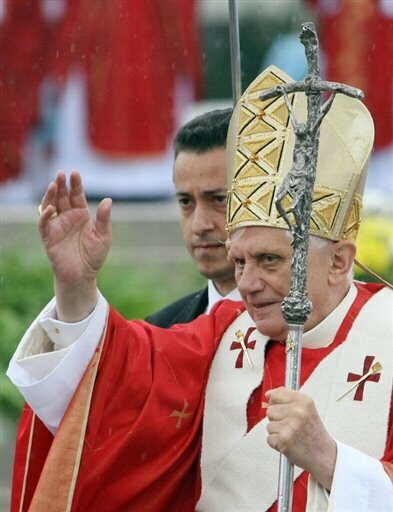 But the next events and days showed clearly that pope Benedict won our hearts. I discussed it also with my relatives and friends, some of them non-believers, and after this trip to Poland they began to have at least warm feelings for the Pope (citing non-believers: "He's such a sweet, good, cute man!"). And Catholics went crazy about Benedict All the stereotypes about Joseph Ratzinger, propagated by some media, has been ovethrown. At last! It was really painful to read and hear all this rubbish about Papa. He was MY Pope from the very beginning and from now on he will be OUR Pope. Later I can post first pages of Polish newspapers commenting the visit. Maybe the rest of the "Polish" team (I mean Yvonne and Tomasso) will also participate. Thanks so much, Sue, for Part 2. It is great for us to be able to catch the excitement of the Warsaw experience even second-hand. I didn't realize that Papa mingled with the crowd at the end of Mass. That was a very risky thing for him to do, not necessarily because that adoring crowd would want to do him harm but just because in their eagerness to get near him, he could have gotten crushed. It seems that no matter how much planning goes into one of these trips, somehow people always end up able to get past his security and up close to him. So your mother lives in Gdansk. Did you know Yvonne lives there too? Small world. But it did look a little scary. Boy, he really was surrounded by that crowd. 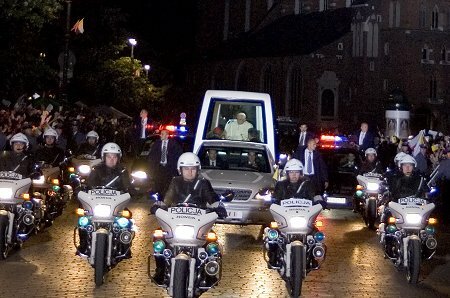 The same thing happened at the end of World Youth Day when he was trying to get back to his car after the final Mass. The crowd was pushing in so hard against the security men surrounding him that he was getting jostled when the security guys were being pushed backward against him. Regarding our small world, my father's parents are from Lublin so I experienced some patriotic pride at a distance at the warm Polish welcome Papa got. Cultural norms of the Vatican, for example, dictated that an American could not become prefect of the Congregation for the Doctrine of the Faith, yet Cardinal William Levada is there anyway. Vatican diplomatic logic held that Joseph Zen of Hong Kong should not be made a cardinal in order to avoid irritating the Chinese, since Zen is the biggest thorn in their side on the religious freedom issue, yet Zen is now wearing the scarlet. Powerful political pressures suggested delay or inaction on the case of Fr. Marcial Maciel Degollado, founder of the Legionaries of Christ, yet Benedict nevertheless imposed sanctions. When a prominent German Catholic visits Auschwitz, there's a certain script that person is expected to follow. One should acknowledge German complicity in the Holocaust, and in some sense ask forgiveness; pledge to fight modern anti-Semitism; and avoid opening old wounds, such as controversies over Edith Stein or the presence of a Carmelite convent near Auschwitz. On Sunday, Benedict utterly disregarded the script -- he defended virtuous Germans who resisted the Nazis, ignored the issue of anti-Semitism, and praised both Stein and the Carmelites. The rest of this item on Kluger I will post in the John Paul section. Allen then goes on to discuss the 'success'' of the Polish trip and the Pope's next big event- his Pentecost encounter with church movements on June 3. The Pope's visit to Auschwitz continues to resonate and will certainly be grist for more stories from the media in the coming days. Here are three from the Italian press which appeared at different times. The Vatican newspaper, in reviewing the Pope’s trip to Poland, defends the Pope from criticisms to the discourse he made in Auschwitz-Birkenau. “The Pope did much through such gestures during his pilgrimage to the extermination camps at Auschwitz-Birkenau. Gestures which anticipated and gave added value to the discourse that the Pope later delivered. “We can therefore truthfully say that his encounter with sorrow and with horror, of which those places remain as tragic symbols, was modulated through gestures and words, both important in order to fully understand the spirit with which the Pope undertook the last stage of his journey to Poland. “And so, there was Benedict XVI who walked alone through the gate of Auschwitz (everybody else stayed back). He was focused, meditative. One could sense he felt the whole weight of the evil which the place evokes. A weight that is oppressive for every man and for every Christian. “And the Pope, who comes from Germany, through that singular solo initiative, seemed to have taken on the weight, as truly the alter Christus, vicar of Christ, who feels and takes upon himself the sins of the world. “It was a perception that gained with every succeeding step – at the Wall of Death, at block 11, and the dungeon where St. Maximilian Kolbe met his death. VATICAN CITY – The Pope recalled to his Auschwitz visit and replied to some criticism he received: he cited “more than 6 million Jews’ exterminated by Hitler, said the ‘Nazi regime’ was responsible for Auschwitz and other ‘factories of death,’, made explicit reference to ‘anti-Semitism’ arising from ‘racial hatred’ and called on humanity to guard against it. Thus Benedict XVI indirectly answered criticisms of his Auschwitz discourse at the general audience on Wednesday. He dedicated his usual catechetical hour to a narration of his four days in Poland (May 25-28) which culminated in that visit to Auschwitz last Sunday. It was evident he wished to cut short the objections that he had not specifically mentioned Nazism, anti-Semitism and 6 million Jewish dead. He said Christians are duty-bound to render their own ‘evangelical testimony’ to prevent “mankind in the third millennium from knowing horrors similar to those evoked” by Auschwitz. “In Auschwitz-Birkenau, as in other similar camps, “ he said, “Hitler ordered the extermination of six million Jews. At Auschwitz-Birkenau, some 150,000 Poles also died, along with tens of thousands of other men and women of different nationalities. Meanwhile, a passionate defense of the Pope’s discourse in Auschwitz was made Wednesday afternoon by German Cardinal Walter Kasper, who spoke to journalists during the opening of a bookstore on Via della Conciliazione. Everything happened in the space of a few minutes. Not more than five. The Pope’s arrival, a large white umbrella protecting him from the rain. The downpour dominating an unreal silence. And he- slowly he stopped at each of 22 stone slabs which, in as many languages, tell the story of the same horror. Then the wind picked up, the clouds opened up and the sun came out. The rain stopped, the white umbrella was withdrawn. And now the Pope is by himself, in front of those memorials. Over his shoulder, from the west, a rainbow starts to show itself across the grey sky that turned blue fast. The place where all this happened is the long-inactive railway of the concentration camp at Birkenau. There, where the train cars with their weight of human beings stopped to unload them. The doors opened and the deportees came out to be lined up and examined. those who would be able to work until they gave out, at which point it was their turn to go to the showers. Without a doubt, Papa Ratzinger felt on Sunday afternoon the weight of history on his shoulders. His face said it, as did his walk by himself, hands clasped, through Auschwitz-1, passing alone through the gate with the inscription ‘Arbeit macht frei’ through which millions of unfortunate human beings were led “like lambs to the slaughter” into the most infamous death camp in the history of the world. Papa Ratzinger arrived at Birkenau’s last train platform after his silent walk through Auschwitz-1, a prayer with uncovered head before the Wall of Death, a visit to Block 11 where St. Maximilian Kolbe died, an encounter with some survivors where he took his time, not concerned about running late as he did (arriving in rome almost at midnight instead of the originally scheduled time of 9:15 p.m.). And at Birkenau, he listened in silence to the chanting of Psalm 22, the prayers, and Kaddish, the Jewish lament for the dead. He lit a candle to “remember the faces of individual victims”. And so he spoke, Benedict XVI did, and he choose to aim high. He said all that he needed to say and felt he had to say. Without, on the one hand, yielding to empty rhetoric, nor on the other hand, deconstructing the trite paradigms of political correctness. In that moment, the rainbow had arched across the sky and seemed to arch down to the east, right over the ruins of Crematorium-II. There are messages that are not conveyed by words – they are entrusted to gestures that may be simple but have strong impact. And in certain cirumstances, they are much more eloquent, because in their essentiality, they go directly to the heart and impose themselves better for our reflection. The Pope did much through such gestures during his pilgrimage to the extermination camps at Auschwitz-Birkenau - gestures which anticipated and gave added value to the discourse that the Pope later delivered. We can therefore truthfully say that his encounter with sorrow and with horror, of which those places remain as tragic symbols, was modulated through gestures and words, both important in order to fully understand the spirit with which the Pope undertook the last stage of his journey to Poland. And television with its silent coverage and its close-ups helped us to catch and to experience these moments fully. And so, there was Benedict XVI who walked alone through the gate of Auschwitz (everybody else stayed back). He was focused, meditative. One could sense he felt the whole weight of the evil which the place evokes. A weight that is oppressive for every man and for every Christian. And the Pope, who comes from Germany, throughout that solitary solemn walk, seemed to have taken on the weight, as truly the alter Christus, the other Christ, who feels and takes upon himself the sins of the world. It was a perception that gained with every succeeding step – at the Wall of Death, at block 11, and the dungeon where St. Maximilian Kolbe met his death. They were scenes marked by a great silence. Even the words the Pope exchanged with a group of survivors were few and essential. Only the Pope’s face “spoke” amd “communicated” strong emotions, pressing questions which arise and interpellate our faith which, faced with such evil, oscillates between trustful abandon and recurrent why’s. Then there was his lengthy solemn progress along the stone markers that honor the memory of all the ethnic groups who found their death in that place, after a calvary of brutality intended to cancel out any dignity that a man possessed. Near each marker, he paused to say a prayer. Unhurriedly, because in the face of sorrow, one cannot hurry. The example of Maximilian Kolbe who offered himself to die – and what a death! – to save a companion in prison, and of Edith Stein, who walked serenly towards the gas chamber holding the hand of her sister Rose, show us that even here in this hell which was intended, thought through and diabolically realized, love did not die and was expressed in heroic acts which memory has handed down to us. And certainly there were other acts, perhaps more common but equally significant, which, even in that desert, allowed the flowering of a solidarity born out of suffering a common unjust sorrow. This is what gives us “the courage of goodness and resistance to evil” which can never have the last word. In this way Marek Edelman, hero of the Warsaw Ghetto resistance, distanced himself from the polemics that ensued after Pope Beneidct XVI’s address at Birkenau. “…since I was a boy, I had wanted to meet Marek Edelman, cardiologist, now 85 ywars old, commandant of a small army for which I feel the greatest respect as well as great emotion: ZOB, a Jewish resistance organization set up by the young men of the Warsaw Ghetto. Among the articles I haven't yet gotten around to translating is a letter written by Lerner to Dino Boffo, editor of Avvenire, stating his criticism of the Pope's speech at Auschwitz-Birkenau. In the same issue, Boffo answered Lerner. thank you for sharing these brilliant photos with us and WELCOME! By the way, the young man on the second photo from the bottom, is that the actor who played JPII? I know some of these pictures are already being posted, but I thought it would be better to re-post them all in one, especially so when they are well-taken. From freerepublic website. And forgive me if I missed your initial posts, but welcome to the Forum and our community of Benaddicts. Wow, Crossroads, what fantastic photos, and welcome!! I love the painting someone did of Papa with the BIG blue eyes, looking over his glasses! Thank you, all, for the warm welcome. I'll do my best to contribute to this forum, whenever I can. @Jil, about the photo of the young man, there's no caption but I think you're right - he's the actor who played the role of JPII. @Music, yes, that photo is my favourite, along with the last Auschwitz photo of the rainbow, umbrella and IL PAPA. Exempts from the conversation with Father Romuald Jakub Weksler-Waszkinel , Roman Catholic priest and a lecturer at the Catholic University of Lublin. Born in the Jewish family in 1943, raised by the Polish family he learned about his background at the age of 35. Since then he works for the better understanding between the Jews and the Poles. The short interview appeared in a Polish Catholic weekly "Tygodnik Powszechny"
"The rainbow, which appeared there, is one of the signs given by God. I have read it as the sign of hope. And this Pope so humble. I have expected strong words, and I have found words full of humility, deeply moving, deeply theological. And I have also found in papal speech the greatness of Israel. Words about the root of Christianity (...) The proof of God's existence - the duration of Israel - it is a thing only a great theologian could get out. But most of all it was the humility of a German Pope which was striking. I was waiting for the words that would bring back the Vatican Council, that would repeat that the Church laments over the signs of anti-Semitism. I rather miss the lack of them. But on the other side I found the words of reconciliation. We are entering the new millennium. It is time to start talking in the language of reconciliation . The past was terrible, it is still painful , but this reconciliation is the reality of the future , where we have to look forward to. That's why the rainbow - the sign of covenant - is the sign of Providence. In the whole humility of the Pope, in his bearing, in his eyes, humble smile, there is light. It is a beautiful sign that after John Paul II, the beautiful Pole, there appears ... the beautiful German, and with him the whole reality of European culture". Thanks so much, Yvonne. The translation was great. The priest's words were very moving and it is interesting to see how he too describes Papa, as so many people who have met him and so many of us do, in terms of beauty and light. Papa, in real life, must be someone who transcends his physical presence just as his words and thoughts soar beyond the limits of each individual word. I must join you, Benefan, in thanking Iwona for that report and thanking Crossroads for all those moving photos - the exultant ones in Blonie Park and the poignant ones at Auschwitz. This is altogether a great page - I hope we can save it [photos and report] for posterity. I forgot about the Warsaw Mass photos - but here they are. Yvonne, I like the hair-raising photo but at which event this happened?? I don't really know. I got from a friend a folder full of photos - many of them are the same you have posted - and among them the "hairy" one. It was among the photos from the airport - the farewell ceremony. But I am not sure. Tutti gli orari sono GMT+01:00. Adesso sono le 4:50 PM.